There are many ways to ruin a car. For fanatics of the one-with-no-mouth, this is an everyday occurrence that they seem able to accomplish without even giving it a second thought. For the true fanatic, however, simply ruining a car is far too mundane. They want to take it to a level that not only makes everyone ask “wtf? Why would anyone do that?” but also makes them cringe that something like it exists in the world. If we are truly being honest with ourselves, I guess we should have seen this coming. 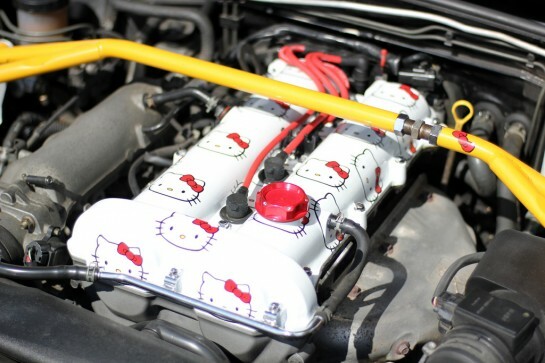 With all the different cars sporting the evil feline’s face these days, and the fact that she also has her own line of engine oil, is it really a surprise that there now exists a Hello Kitty engine? Actually I think it’s pretty awesome. ..it shows that a lot of care and attention to detail has gone into the car….love it or hate it, it certainly seems to grab attention, as this little rant of yours shows. I wonder what car you drive? And whether you look after it as well as this owner obviously does? Thanks for sharing the Hello Kitty love ?? I suppose it was only a matter of time till my engine cam-cover found it’s way here! It hasn’t blown up yet. But it does have a blower on it now. A supercharger. If it does explode I will let you know. Actually, it’s a cam cover, and I say hats off to the owner for making their car indevidual. Kitty wouldnt be my chice, but it is theirs and good luck to them. Obviously not as narrow minded as some people.